Delphi Automotive's brain trust thinks it has a winning business strategy -- smart technology with a heavy dose of software -- and it's likely to stick with that plan under its new CEO. Kevin Clark, who became CEO on March 1, is a finance guy with a background in private equity. Clark, 52, joined Delphi in 2010 after he helped launch Liberty Lane Partners, a private equity firm in Hampton, N.H.
His background in finance and private equi-ty has proved useful. In recent years, Delphi has added several of what former CEO Rodney O'Neal called "bolt-ons," or acquisitions that beef up the supplier's existing products without transforming the company. Clark "was a key driver" in those acquisitions, and he helped arrange the sale last month of Delphi's thermal division to Mahle GmbH, according to company spokeswoman Andrea Knapp. The biggest deal came in 2012, when Delphi acquired FCI Group's motorized vehicles division, a maker of electrical connectors, for nearly $1 billion. 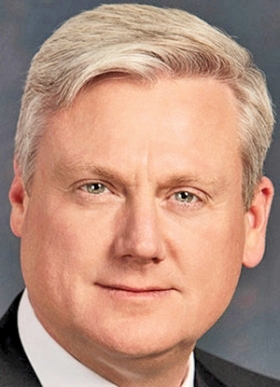 Delphi now is the world's second-largest supplier of automotive connectors, Knapp said. But a smaller deal, Delphi's partnership with Ottomatika Inc. in November, hints at the company's future. Ottomatika, a Pittsburgh startup, develops software for automated driving. During a Feb. 5 conference call with industry analysts, Clark predicted that Delphi's active safety revenue will rise 50 percent annually for the next five years. Delphi enjoys strong demand for radar, cameras and computer chips that control multiple sensors. "That's where we'll continue to see tremendous growth," Clark said. To feed that growth, Clark said there may be opportunities for "relatively small technology investments" in software developers, as well as more traditional acquisitions. Clark said, "Software is becoming a bigger component of our product portfolio, without a doubt."